Here is another HalloweenDrinks.net original cocktail for both Halloween and the holidays that I'm calling the Indian Corn Layered Smoothy. Indian corn candy is the inspiration, you know the stuff, the cousin of candy corn. But the spark of invention came after spotting Three Olives Purple Vodka. I was concerned that the grape flavor would be a problem, but the result is good, really good! And I'm a harsh critic of sweet drinks. I had trouble with the name, but decided on "smoothy" as the cream is what makes this distinct, and it has a smooth, sweet creamy flavor that changes from the beginning of the drink to the end of the drink. Now the hard part....making the drink. The layering is the hard part. Layering works because the density of each ingredient is different. The pumpkin liqueur will sit on the bottom, with the vodka happily staying on the top. The cream will float on it all. But the act of pouring is key as it is easy to end up mixing two layers. In an open glass, like a martini glass, you can hold a spoon over the glass, just to one side and pour slowly into the spoon. I prefer a deeper glass like the scotch glass shown here, or a champagne flute. This requires even more care. The pumpkin liqueur is easy, but then put the vodka in a small ladle, hold it close to the pumpkin liqueur, and pour slowly. Same for the cream. Use just enough cream to cover the top. The first sip comes out mostly grape -- the vodka. Then it mixes with a little cream. It gets creamier as you continue and then the pumpkin emerges and gets stronger as you drink more. There is a lot of alcohol in this cocktail so enjoy responsibly. And now the third in this set, the coveted Subtle Pumpkin Martini. Two fellow martini drinkers taught me to appreciate a classic Bombay Gin martini -- the gin had to come straight from the freezer. Oh so dry. Two olives and an onion..... So when it came to creating pumpkin martinis, I needed something that would appeal to me as I'm not a fan of sweet drinks. After much experimentation, here it is. This is good, if I do say so myself. And I know it will appeal to any classic martini drinker. The proportions are really important in this drink. You can scale it up, but keep the proportions the same. The balance is what makes it work. You could also use Lagavulin Scotch, but you might want just a wee bit more. It is the smokiness we're after here, so you need one of the heavier smokey, peaty Islay malts. So good.....the color is a pale straw, just a subtle hint of pumpkin and the tinge of smokiness. This is a year-round martini. And for your classic martini drinkers, this may become their new drink of choice. One variation that works very well, is the same basic recipe but instead of gin, I use vodka from Dry Fly Distillery. I'm not a normally a vodka fan, but Dry Fly's is amazing and it works great in this drink. I'm still searching for the perfect garnish. I can't quite bring myself to put in olives, though they may work fine. Let me know if you discover a garnish that fits this perfect martini. 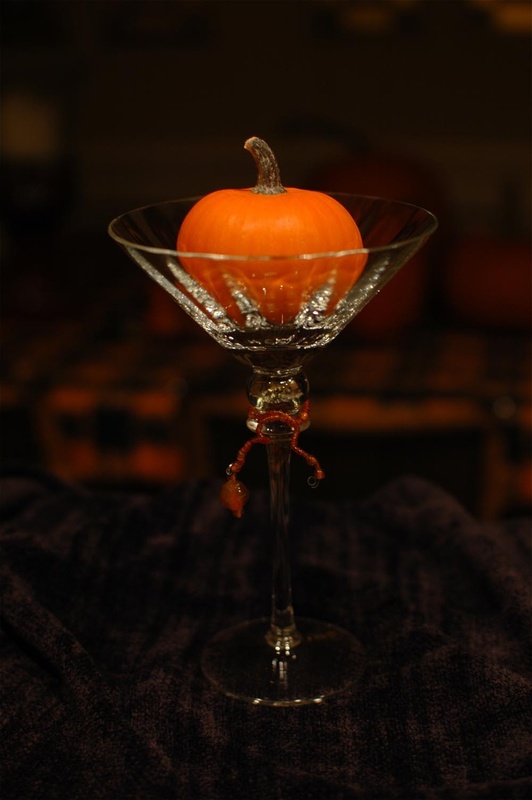 This martini is just a variation of the Sweet Pumpkin Martini, it is still sweet, but tame in comparison. Very simple, very elegant, and easy to make. This recipe is also versatile, it works either vodka or gin, so take your pick. Pour the ingredients into a cocktail shaker with ice, shake well and strain into a martini glass. Add the candy corn for garnish. Hold it up to the light, the color screams out Halloween! This martini will serve you well through Thanksgiving and the holidays too. First up is the big frou-frou Sweet Pumpkin Martini. When someone say's, I want a pumpkin martini, start here. You've got to be a fan of sweet martinis though, if not hold out, there are others on the way. Before mixing this up, prepare your martini glasses with a rim of cinnamon/sugar mixture. Premix some ground cinnamon with sugar (superfine us supposed to work best), pour a few drops of vodka into the glass, and turn the glass partially upside down while rotating to wet the complete rim. Then dip the rim into the cinnamon/sugar mixture. Pour the above ingredients into a cocktail shaker with ice, shake well, and pour into your prepped martini glass. Toss in several candy corns for garnish. Get ready to make more, they are always a hit. I'm starting a series on the coveted pumpkin martini. My adventure for the perfect Halloween drink started with the pumpkin martini and led to the creation of my own pumpkin liqueur. I'll be posting a few tuning suggestions on pumpkin liqueur recipe as well. My experiments have led to three variations that have become hits. First, is the big over-the-top Sweet Pumpkin Martini (center). Next, is the slightly toned down Classic Pumpkin Martini (right). And last but not least, my personal favorite, the Subtle Pumpkin Martini (left). Now that I have some new photos of my versions, I'll get all the recipes posted. And on the topic of garnishes and drink glass charms, check out these Halloween wine, beer, and drink charms from tartx at etsy.com. The vintage Halloween theme works great. JenniB from aWellCraftedParty.com has put together a great roundup of Halloween drinks and cocktails in her Friday Finds:Halloween Drinks column that includes everything from non-alcoholic drinks to punch, garnishes, and even barware. 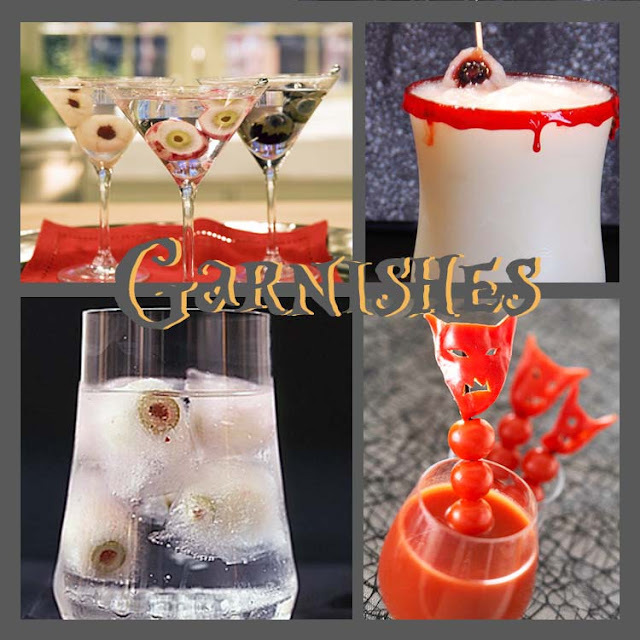 I was particularly intrigued by the garnishes as every great Halloween drink deserves a seasonal garnish. Original images via hostessblog.com, bhg.com and Martha Stewart. 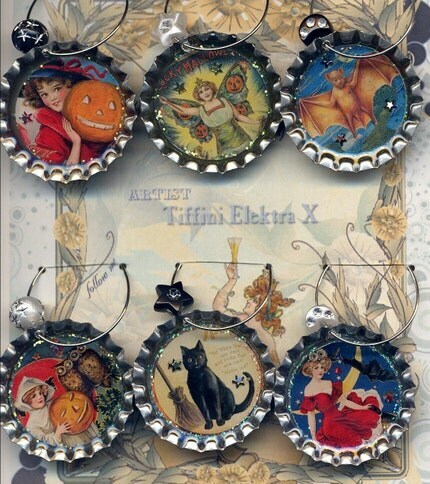 I've used these black cat drink charms for some time, but they appear to be discontinued now. How perfectly Halloween, the Black Martini! From Colleen Graham, the cocktail maven at About.com, we get a recipe with several variations for a Halloween black martini. Not sure how this will taste, but it looks great. I'm going to try pairing this with my pumpkin martini for an orange and black martini combo. The Blavod black vodka gets mixed reviews on taste, but the color is nice. I'm compelled to try the black raspberry liqueur as well, that might taste better.